The payment analysis report displays how, when, and what types of payments are received at your practice for a specified date range. On the Home menu, under Reports, click (or tap) Payment Analysis. 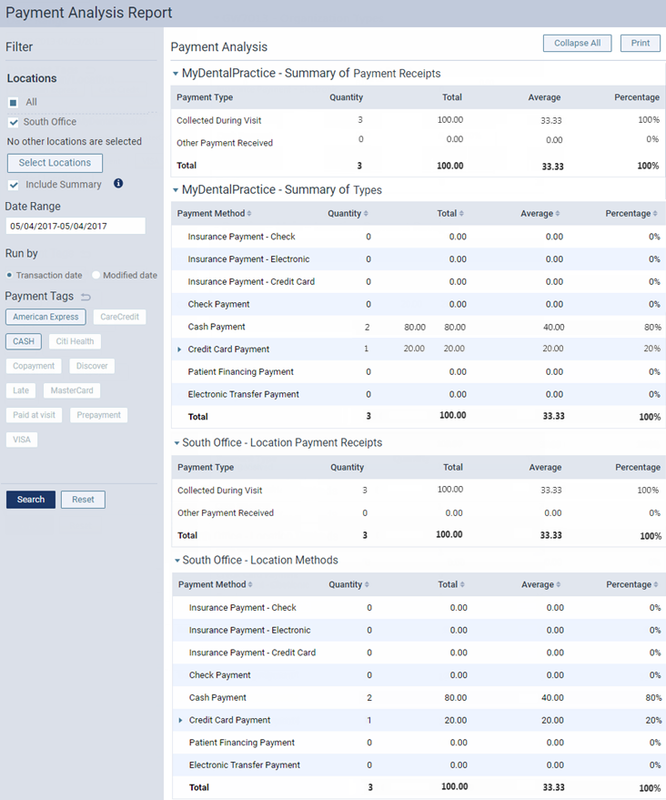 The Payment Analysis Report page opens. Select the All check box to view payment receipts and payment type totals for all locations and your organization. Select the check box next to your organization's name to view the organization's payment receipts and payment type totals (the sum of the payment receipts and payment type totals for all locations in the organization). Select the check boxes next to any of the location names to view the payment receipts and payment type totals for each of those locations. Click Select Locations to select the desired locations. Date Range - The date or date range of payments to include on the report. Leave the current date selected, or select the desired date (today, yesterday, or a specific date) or date range (last 7 days, last 30 days, this month, or a custom range).